Hotmail users and newbies are flocking in droves to Outlook.com, Microsoft’s latest Webmail overhaul that will eventually replace Hotmail. Less than 24 hours after Microsoft rolled out Outlook.com, one million people were already using the service, according to an official tweet from Microsoft. The new Outlook continues Microsoft’s overhaul of all its Web properties to the new touch-centric Metro feel -- the same look that’s coming to the Windows 8 Start Screen and is already on Windows Phone. Launched in 1996, and bought by Microsoft in 1997, Hotmail was one of the earliest free Webmail services and became the first e-mail address for millions of people, perhaps rivaled only by AOL Mail. But what was once new and exciting in the late 1990s became stagnant and less innovative by the early 2000s. Around 2004, Google’s Gmail was the hot new e-mail service, while Hotmail appeared dated. That lack of trendiness, however, did not cause Hotmail to bleed users. In fact, it was only recently that Gmail finally surpassed Hotmail, reaching 425 million active users in June, while Hotmail’s last reported user base hovered around 360 million. Microsoft’s Outlook.com overhaul comes just in time to help Hotmail/Outlook try to regain its position as the world’s top Webmail service. It’s not clear when Hotmail will be completely absorbed into the new Outlook.com, so longtime Hotmail users resistant to change can stick with the older Webmail service for now. But if you’re interested in getting started with Outlook.com today, here’s what you need to know whether you’re a Hotmail veteran or new to Microsoft Webmail. If you already have a Hotmail address or Microsoft account, just sign in to Outlook.com using your current credentials and you will automatically switch over to the new look. 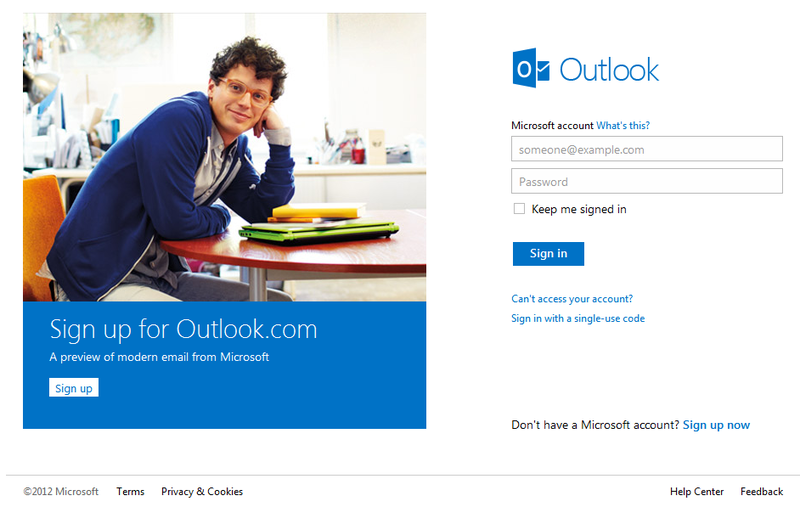 New users can also sign up for an account at the Outlook.com start page. 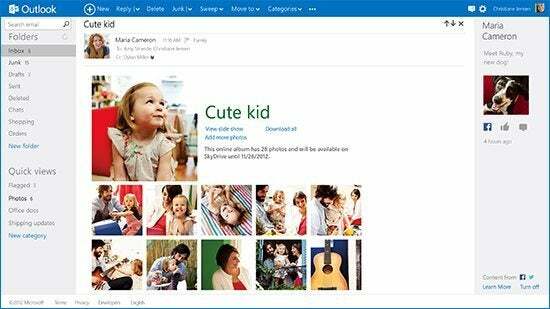 The new Outlook uses the same four-column design that Hotmail does with some slight differences. On the far left you have the Folders and Quick View Pane, next to that is the message list, followed by the largest column where you can view messages. The biggest change is in the far right column, which in Hotmail was occupied by ads. When you login the first thing you will see in the far right are Bing deals and offers (ads), but you can turn that space into something more personal by clicking on the Messaging icon in the top right corner. Just like Hotmail, Gmail and Yahoo Mail, you can chat with online contacts straight from your Outlook.com inbox. Click on the messaging icon in the far right corner (the square-shaped smiley face) to open the Messaging pane. Outlook’s Messaging will be familiar to anyone who has used the Messaging app in Windows 8. You start with a blank pane and you have to click the “Start new conversation” text box to see your online contacts from Messenger and Facebook. Once you start a conversation in the Messaging app, it will stay in the right hand pane along with the most recent comment until you close the Outlook.com window. Similar to Outlook 2010, Outlook 2013 and Gmail’s People Widget, you can see information about your contacts pulled from social networking accounts such as profile photos and status updates. This information is displayed in the far right column when you view an e-mail, but you will not see this sidebar if you have the messaging pane open. To close the Messaging pane click the “X” in the far right corner.